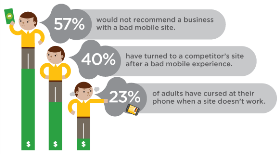 YOU NEED A MOBILE WEBSITE NOW !! $14.95/MTH* OR $119 /YR Advance. We will design a mobile website / landing page that will recongnize that your customer is on a mobile phone and redirect only them to your mobile site for a seamless mobile experience that will captivate and motivate them to call, visit, and buy from your business! NO LONG TERM CONTRACT !! !.....QUIT ANY TIME !!!..... But you won't..Because we KNOW it works! AT THIS PRICE CAN YOU REALLY AFFORD NOT TO TRY IT? "THE FINE PRINT"...."SHHHHH"....COME CLOSER..............CLOSER.........."SOMETIMES YOU CAN GET YOUR SITE FOR FREE' !!!...................................... ".ASK US HOW"
Entrench and encourage Repeat Sales Through Increased Satisfaction. Enables Different Marketing or Coupon Strategies for mobile customers and desktop customers. 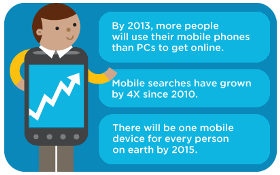 Rank Higher on Google Mobile Search and recieve better add rates. Positions your business inline with "The Future" Convergence / Mobile / Cloud / Social / Realtime. 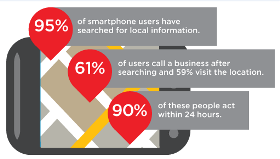 YOU GET CALLS AND VISITS From New Mobile Customers, who are near your business looking to buy.